At one time we seemed as a country to be building what the American's describe as McMansions - houses that take on the girth so much a part of modern society. 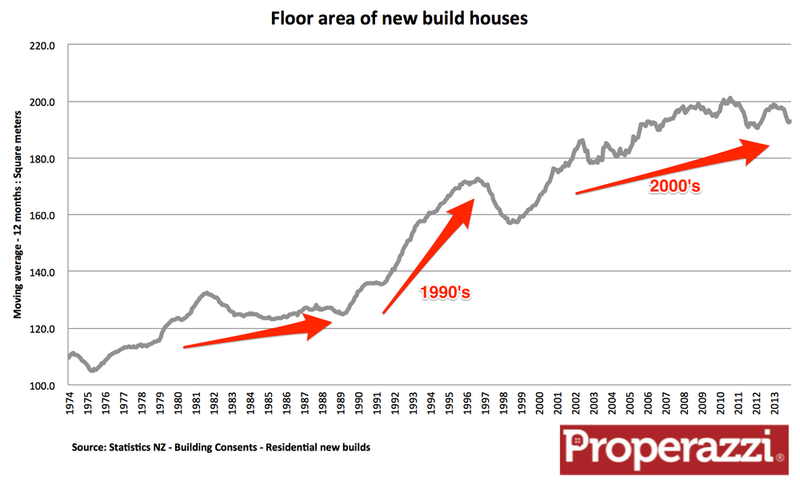 Certainly through the early years of the 1990's we saw average size of new houses built rise from 125 m2 to 170 m2, but of late the average size has been waning. In fact in the last decade based on building consent data we appear to be revising our ambitions or at least realising the impact of greater urban intensification we have hardly seen the average size of new homes change. For a time the average new home did break through 200 m2 but that did not last long. Now compare this trend with the comparable data from the US over the same 15 year period. In that time the average US new built home has grown from 204 m2 to the latest data showing that new houses have grown in girth to over 250 m2. A lot of this growth has occurred in the past 5 years - a time when US house building has been in the doldrums after the GFC - that might well identify as the article from which this data was collected identified that "Americans Are Increasingly Buying Bigger, More Expensive Houses".